Under TASK 8.2: INNOVATIVE APPROACHES FOR REPRESENTING VARIABILITY AND UNSTEADINESS IN FLUME FACILITIES, UPC ran armour layer stability tests in the Wave Flume. The objective of this study is to understand the laboratory effects of storm representation and test repeatability on damage measurements in the armour layer of a breakwater. For that, we study in a small-scale wave flume the effects of storm duration and storm sequencing on the stability of a two-layer cubic block breakwater. We start by simulating a real storm measured in the Mediterranean Sea. Then three different representation models of the real storm are simulated: the classical model (Melby & Kobayashi, 1998) and two ‘Equivalent Magnitude Storm’ (EMS) models with triangular and trapezoidal shapes (Martín-Hidalgo et al., 2014; Soldevilla et al., 2015). All the four methodologies are repeated at least ten times. For the assessment of the damage in the armor layer of the breakwater, the damage parameter (relative damage) proposed by Van der Meer is used. Results can be found on page http://hydralab.eu/research--results/jra1-recipe/JRA1-RECIPE---Results/UPC-Armour-layer-stability-tests/ of the website. UnderTASK 8.2: INNOVATIVE APPROACHES FOR REPRESENTING VARIABILITY AND UNSTEADINESS IN FLUME FACILITIES, Deltares ran Individual Wave Overtopping Tests in the Scheldt Flume at Deltares. 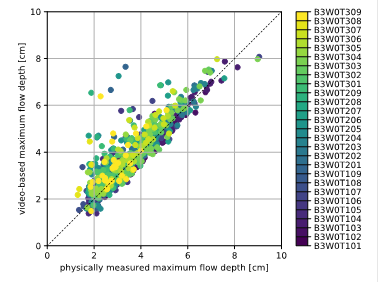 A series of 27 tests in the Scheldt Flume at Deltares were used in this study. The tests were characterized by a breakwater with a smooth slope that was exposed to approximately 1000 waves. Between the different tests the water levels (3), wave height (3) and wave steepness (3) varied. 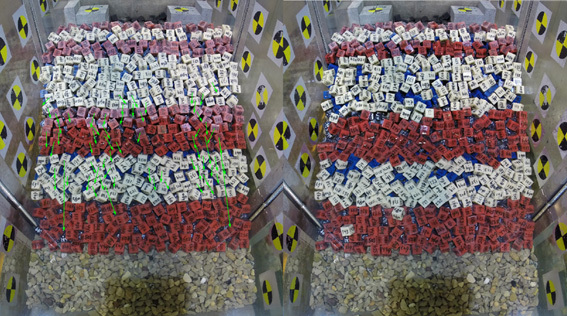 In addition, the same series of 27 tests (and 6 repetitions) with the same wave forcing and similar breakwater shape, but with a rubble mount slope and crest wall, was used to broaden the applicability of the automated semantic segmentation techniques to more turbulent waves. These tests were used for model training, but model testing focused on the smooth slope tests since a better model/data comparison was possible. Data were acquired from 150 Hz high-speed video footage through the glass flume wall using a single camera mounted on a tripod approximately 1 m from the flume. A flow depth measurement at the breakwater crest is used to order the waves on impact. From the top 100 waves with largest flow depth in each test 50 waves are used in the analysis. Figure 1 shows an overtopping wave. Results can be found on page http://hydralab.eu/research--results/jra1-recipe/JRA1-RECIPE---Results/Deltares-Individual-Wave-Overtopping-Tests/ of the website.